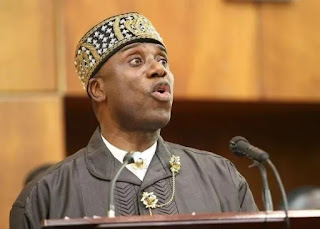 Rotimi Amaechi, the Minister of Transportation, on Friday told Opobo people of Rivers State to blame their leaders if one of them failed to emerge governor in 2019. News Agency of Nigeria, NAN, reports that the Minister stated this at a reception organised by Free Rivers Development Initiative (FRDI) to honour him and Dr Dakuku Peterside, Director-General, Nigeria Maritime Administration and Safety Agency (NIMASA) in Opobo. Amaechi said that the Ikwerre chiefs were not united in the struggle to elect their subject as governor of Rivers. “If you don’t get the governorship of Rivers in 2019, blame your chiefs for not having a united front,” he said. He charged the people to join the struggle for the race, saying “people of Opobo/Nkoro Local Government Area must mobilise strongly and sack Gov. Nyesom Wike in 2019. “Let me tell you the honest truth, you must start mobilising now because you have not shown enough anger that you want the current government in the state out in 2019. ” The former governor of the state said that his administration would have reclaimed more land for Opobo town but for the difficulty in getting more sand in the river. “If you ask Peterside, your son, we were supposed to do more land reclamation than what we did, but unfortunately there was no sand in the river. “We are not here for talk about what we did, but we will soon compare my first tenure as governor and that of Wike. “We are here to show gratitude to Opobo people for showing us love, especially Dr Sam Jaja, Chairman, University of Abuja Teaching Hospital Governing Board,” he said. Speaking, Peterside described Amaechi as a kind-hearted person that was always willing to take up the responsibility of others. Peterside said that it was uncommon to take up responsibility for people’s challenges, but that the Transportation Minister had lived a life in fighting for others. “My leader, Amaechi took up the challenges of the development of Rivers and beyond that, fought for us all,” he said.